NARRATIVE: On 03/08/07 at approximately 1157 hrs units of the City of Spokane Fire Department responded to 3923 E Pratt upon report of a structure fire. The first arriving unit on the scene found heavy smoke coming from a one story, wood-frame, single-family residence. Smoke was evident from the eaves, front door, and chimney areas of the structure. E-7 crew members advanced a pre-connected hose-line in the front door of the structure and found fire advancing up the stairway from the basement. Fire crews continued to fight their way down the stairs and extinguished the main body of fire in the northwest portion of the basement. Other assignments completed during this fire incident included crews advancing a back-up lead to protect E-7 crew members, firefighters ventilating the basement and first floors of the residence, search of the first floor and basement areas for possible life hazards, and the check of areas of the first floor for extension of fire. No extension of fire was found on the first floor. A total of 23 firefighters on 9 apparatus battled this blaze. No injuries to either firefighters or civilians were reported. The main body of fire was extinguished within approximately 20 minutes with crews remaining on scene for approximately 2 more hours to assure extinguishment. Fire damage was confined mainly to the basement area of the residence, with smoke damage evident to both the basement and first floors. PROBABLE CAUSE: The cause of the fire is undetermined at this time. Fire investigators are still analyzing the scene, and information surrounding the incident. For more information on the cause of this fire contact Capt. Mike Zambryski at 625-7052 during normal business hours. DAMAGE EXTENT: A family of five occupied the residence. The fire was discovered by one of the young adults occupying the home. The main body of fire, at the time of discovery, was in the north-west portion of the basement. This is an area containing a hot water heater, softer water unit, the electrical panel for the residence, among other items. Great Pictures from the Columbia Stairclimb! 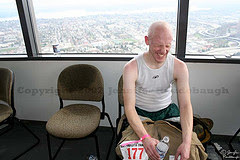 As you may know, On March 4th, 2007 in the Columbia Center in Seattle Washington, was the Scott Firefighter Stairclimb. As a Washington State photographer I was allowed access to the event. If you are interested in licensing any of these photos, please contact me. NARRATIVE: On 3/3/07 at 10:22 P.M. the Spokane Fire Department responded 6 fire companies and 2 battalion chiefs to a reported garage fire at 611 E. Gordon. Upon arrival, fire crews found a detached garage behind a residence with significant fire showing from inside. Fire crews immediately attacked the fire with hose lines and at the same time, protected nearby structures, conducted search operations inside the garage looking for anybody that could be inside, coordinated water supply, assembled backup crews and provided ventilation to let the hot smoke and fire out in order for crews to get inside the garage quicker. The fire was successfully contained and controlled in 20 minutes. On scene examination and interviews with the homeowner revealed that the cause was improperly discarded hot ashes from a wood stove that were placed inside a cardboard box inside the garage. The garage sustained major damage and a significant amount of contents being stored inside the garage also received major damage. Fire crews were busy for over two hours conducting "overhaul" operations which is the phase of the fire where every hot spot, ember, or visible smoke is investigated and extinguished. This often is a very arduous task because crews have to tear apart walls and ceilings to get to the source of the heat. Thermal infrared heat cameras were used to help accomplish this task. The incident was turned back over to the homeowner at 12:45 A.M. There were no injuries to firefighters or civilians at this incident. The Spokane Fire Department would like to take this opportunity to remind everyone that ashes can often appear to be out. However, they can hold in heat for a long period of time and must be dealt with in a safe manner by placing them in a non-combustible container and removing the container from other nearby combustibles. PROBABLE CAUSE: Improperly discarded hot ashes from a wood stove. The ashes were placed inside a cardboard box inside the garage. DAMAGE EXTENT: Major heat damage to the metal clad wood frame garage structure. Major heat and smoke damage to a large amount of contents inside the garage. Contents included personal items and a gas fired heater.